Hiking does not need to be limited to spring, summer, or fall—it is also a wonderful experience in the winter! Exercising in cold weather is healthy, invigorating and refreshing at the same time. And since fewer people hike during the cold months one gets to enjoy more solitude while wandering the winter wonderland. Hiking and backpacking are some of my big passions. Not only is hiking a great way to experience the beautiful outdoors and get a nice workout while simply walking, but for me it is also a form of meditation and a way to connect with myself and nature. I prefer to go hiking alone or with my partner, but it can be fun with a group of like-minded people as well! It wasn’t until last year that I discovered the beauty of hiking in the cold winter months. Although I grew up in Switzerland, I was never very fond of the cold and didn’t enjoy any of the typical snow sports activities. 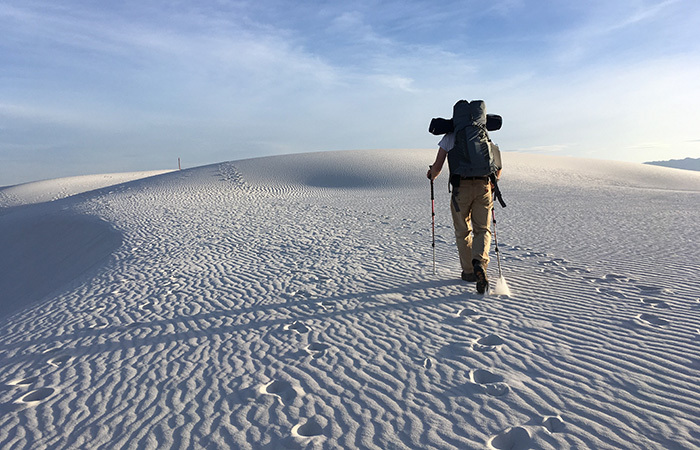 But last year I was training for a long and strenuous backpacking trip, walking up and down hills with weights on my back a few times per week in preparation. 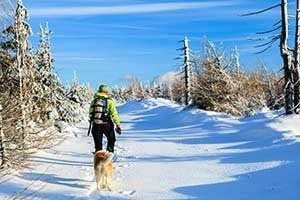 It was during those cold January training days that I discovered that hiking in the snow can be really fun, especially if you are well prepared for your trip. What makes it so special? The cold air is healthy when you’re exercising, there are terrific snow-laden views, and you’ll find fewer people on the trails! However, it can be more challenging too. It can be difficult to see the trail and harder to follow trail marks. The deeper the snow the harder the workout, and of course being in the cold for extended hours requires appropriate clothing and equipment. To keep us warm our body must work harder when in the cold. 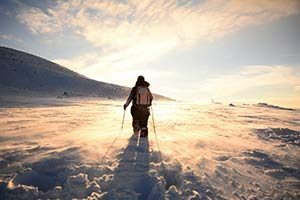 As a result, we burn between 10-40% more calories when exercising in cold weather. Being in the cold helps reduce inflammation and constricts superficial blood vessels, while exercise in cold weather improves circulation more than exercising in milder temperatures. 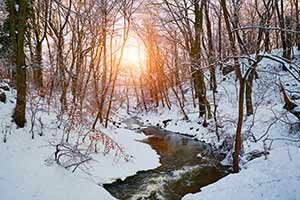 Being in a brighter environment (since snow reflects light) will increase serotonin output and as a result improve your mood. Spending a day outside in the bright snow helps to fend off seasonal mood disorders like the winter blues. Cold weather helps build greater endurance by strengthening the respiratory and circulatory systems. 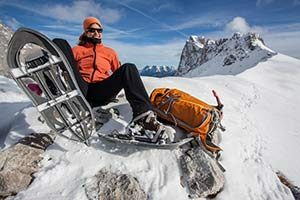 Food: due to high-energy output during winter hiking or snowshoeing, be sure to bring plenty of food and eat before, during and after the activity. Choose protein, fat, and carbohydrate rich foods as they all provide energy. Energy bars are great to nibble on. Avoid alcohol and caffeine as they are dehydrating and interfere with circulation. When adventuring the outdoors, always let someone know where you are going and leave emergency information just in case. Also bring a piece of paper with emergency information, important phone numbers, your blood type, advanced directives, and names of emergency contacts. Make sure to drink plenty of water throughout the hike. Taking a few sips every 15-30 minutes is the best way to prevent dehydration, which can easily happen in colder weather since we don’t feel as warm. A Camelbak water system is great for that, but be sure to blow air into the tube after drinking, as the water will most likely freeze in the cold. The body cools down quite quickly when standing still during your hike, so it’s best to put on another layer at the beginning of a break and to keep breaks short. It’s better to nibble on food while still moving than to sit down for more than 15 min for a bigger meal. Avoid walking in streams or puddles to keep your shoes and pants from getting wet. If well-prepared, you should have a great time out there while staying dry and warm. 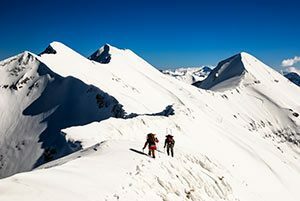 However, anything can happen at any time, and the following are possible concerns: Slips and falls, hypothermia, frostbite, dehydration, and snow blindness. Harriman State Park: The second largest state park in New York offering over 200 miles of hiking trails and over 30 lakes. There are multiple options of course to get to one of the trailheads at Harriman State Park. I usually take the train from Penn Station to Tuxedo (Penn Station to Secaucus, then Port Jervis Line to Tuxedo which takes less than 90min) The trailhead begins at the station, crossing the railroad, winding through a small residential area to the beginning of the woods and then with an increasingly steep uphill climb into the beautiful wilderness. From there you can choose several loops and trails. Tuxedo is a small town and there are a couple of restaurants next to the train station as well as an old grocery store that functions as a diner. Here you can get a nice hot cup of soup after your hike before boarding the train back home. Your muscles will be sore even if you work out on a regular basis. The snow will put additional strain on your muslces and the uphill and downhill activity will activate your muscles a bit differently than when you’re running on flat terrain. Hiking uses all the muscles in the body, but the following muscles will get the greatest workout: Your glutes, hip rotators, hip flexors, hamstrings, quadriceps, calves, ankle stabilizers, abdominals, the muscles surrounding the spine, lower and upper back, shoulders, and neck. I’d recommend that after your hike you take some time to stretch your hamstrings, quadriceps, calves, spine, shoulders, and neck. Getting a massage and making a visit to the steamroom, sauna, and whirlpool are great ways to recover and reduce post-workout soreness, while increasing your overall wellbeing.